Do you enjoy beer? Do you have beer-appreciating friends with upcoming birthdays? I’ve got just the book for you! 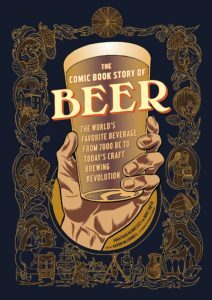 The Comic Book Story of Beer is a gorgeously and ornately illustrated history of the brewski. As the title implies, the 173 pages of this book covers everything from the misty origins of beer through prohibition, homogenization, and the recent fanning out of styles and breweries. It’s not too detailed to boring for the casual drinker, and it’s not so broad that beer nerds won’t learn anything new. There are really two or three levels to review here – first the art. Aaron McDonnell deserves special mention for the diversity in style and color he employs as the book moves through time and geography. There’s also a playfulness to the art that’s a lot of fun – make sure to spend time on each page. Finally, the book really did teach me. I learned more about where certain styles of beer came from and the context in which they developed, why we moved from regional to national brews, and how the current microbrew explosion is really getting things more back in line with traditional beer than taking us somewhere new.